Despite tremendous improvements in document capture technology and ease of use becoming more prevalent, the fact of the matter is that document capture is not totally automated and often involves human intervention. Therefore, careful considering the pro’s and con’s of your document capture strategy is imperative to ultimately create better operational efficiency within your organization or, unfortunately, cause unnecessary burden within your business process. Technologies such as Intelligent Document Recognition (IDR) or Automatic Forms Processing to automatically identify documents and extract information from scanned images are fairly amazing and perform highly automated functions if the system is designed with well-known document types. In other words, the information on the pages such as a invoice number is in a fairly consistent part of the page (i.e. always in the upper-right hand corner of the page). But when more and more document types are introduced to the capture system, the complexity of the system becomes exponentially more difficult and chances are that the automation accuracy will decrease. The truth is that these capabilities are not complete magic (yet) and require system administrators to carefully develop capture strategies that assist the capture software in making intelligent decisions about documents. If you are in the document capture or document scanning business you’ll often hear the phrase similar to, “Oh, I’ll just use my existing multifunction device to scan to a folder and let my capture software process the scanned images from the folder.” While this approach of document capture is certainly an option that works, this road to document capture is littered with potential potholes, possible dead-ends and a lot of downstream work that should be carefully considered. The idea of scanning images into a folder and then performing data extraction from these images is certainly not new. 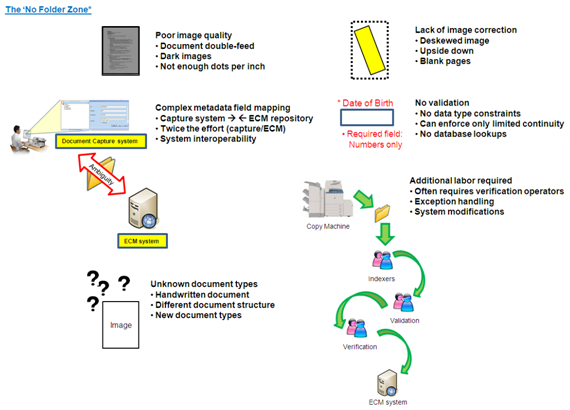 In fact it is probably the most commonly used method to get images into document management systems, however there are certain considerations to take into account when using this capture technique. Just because it’s simple to configure, cost effective and works, this does not mean that it is necessarily the most effective. For some of the reasons I will elaborate below why some many organizations are choosing to enter… The ‘No Folder Zone’. While there are several methods to get an image into a document management system (including scanning to a folder), what is just as, if not more, important is getting the properly associated metadata or index values with that image into your repository for search and retrieval purposes. Otherwise your document management system is nothing more than a glorified publicly shared folder on the network where retrieval of these images is done by memory or found by file name only. Scanning to a folder is not necessarily a bad thing based on your organizations particular requirements, however when many people are contributing scanned documents into a system this creates honest mistakes such as lack of consistency, decreased efficiency and potential security or retention risks. The main point about The ‘No Folder Zone’ is not to bash all that is wrong or point out potential pitfalls with scanning to folders. In fact. this is a great solution if this is truly what a particular organization requires. However, far too often taking the simple approach of scanning to folders is the easy way to offer document scanning to users and many of the other issues this causes are not carefully considered. As system administrators become more aware and truly understand some of the incredible advances in document capture technology then hopefully they can appreciate that a well-designed document capture system can drastically help reduce labor costs, improve quicker access to information and be a strategic business advantage, as well as improve adherence to compliance or regulatory standards. Remember to be careful when entering The ‘No Folder Zone’, where if your capture system integration strategy is not carefully considered, this is the place where images go in…but they rarely come out!